This page is useful for current owners of the Guidebook and Atlas who want to download the electronic file containing the GPS waypoints used to construct the Atlas. 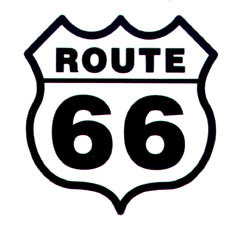 GENERAL DESCRIPTION: These are instructions for using the eight Route 66 GPS waypoints files, one for each state. BACKGROUND: The files were originally built by Rich Cunningham, cartographer and co-author with Bob Moore of "The Complete Guidebook and Atlas of Route 66", which is described and displayed in this website. The software used to construct the atlas was the National Geographic software program named "TOPO". 1) The open source GPX format, which can be imported into many GPS receivers and software programs. 2) The National Geographic proprietary "TPO" format, which can be used by the National Geographic "TOPO" software program. You can check out "TOPO" at this web address: natgeomaps.com/topo_state.html. The NG "TOPO" program is published and sold on a state-by-state basis (except for the smaller states, which are grouped together). Each state costs $49.95 for a total of about $400 for all eight Route 66 states. Now you may be asking why on earth one would want to spend $400 instead of using the free GPX format? The answer is that there are symbol differentiations and colorations that are visible and useable in the TPO format that do not translate into the GPX format because the differentiations are unique to the TOPO program. The differentiations are displayed in the printed version of the R66 Atlas if you want to examine them. Click here to see the sample pages included in this website. Both formats can be downloaded as a single ZIP file, with all eight state compressed using the standard ZIP format. They can be unzipped with WinRAR, WinZip or any other un-zipping program. Click here to download the GPS ZIP file in GPX format. Click here to download the GPS ZIP file in TPO format. Best of luck in your travels on the Mother Road!